Idlewood, Los Santos (near), showing Big Smoke's home (light green) and Downtown Los Santos (distance); as depicted in GTA San Andreas. 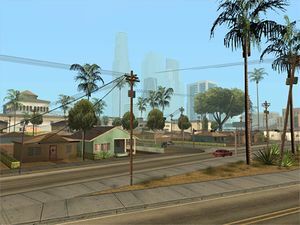 Idlewood is a district in Los Santos, San Andreas. North of the district are Glen Park and Jefferson, while to the south are Willowfield and El Corona. Districts west of Idlewood are Commerce and Little Mexico, while to the east are Ganton and East Los Santos. It is likely that Idlewood is based on real life Inglewood. Idlewood, in 1992, had become a stronghold for the Ballas gang, but the district had previously been held by Grove Street Families. Carl Johnson can acquire Idlewood as GSF turf by starting a gang war, depending on the player's actions. Two gang territories in Idlewood are taken back for the the families in the mission Grove 4 Life, however, it is the player's choice which two Idlewood territories they want to take over in the mission. 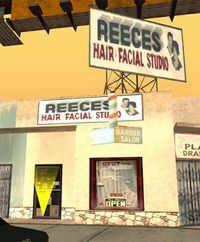 Reece's Barber Shop in Idlewood. Multiplayer icon down the street from Big Smoke's house it is also next to a gang tag. If you walk into the Ganton Gym during a gang war, the territory will remain neutral for the rest of the game. This page was last modified on 6 February 2013, at 21:51.